We hail from Clarkston, Michigan. 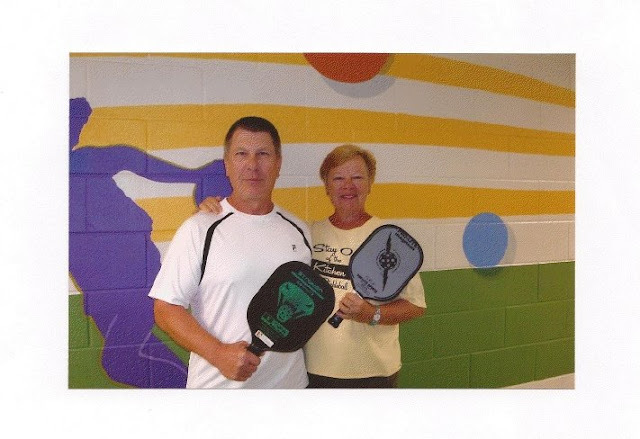 About 4 years ago, the Senior Center in our area sponsored a pickleball demonstration put on by two ambassadors. We absolutely loved it! When we came down to Florida, we hooked up with Jim Wikoff and Carol Walker who were promoting pickleball at the St. Pete Beach Community Center. We pitched in teaching people how to play and score. The St. Petersburg Times did an article on us on Sundaym January 17, 2010 and it put pickleball on the map at the St. Pete Beach Center. We have enjoyed meeting new people and teaching the game we love. It has been a natural progression for us to become ambassadors of the sport. We currently spend much of the year in S. Pasadaena, Fl . Bill is retired from the took and die industry. Karla is a retired special education teacher. We enjoy traveling, tennis, swimming and of course pickleball.